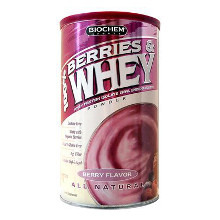 If you'd like to see if 100% Berries & Whey contains substances that are banned by your sports organization's Banned Substance List, sign up now or log in. Declared Ingredients Vitamin C (as organic blackberry, organic raspberry), Calcium (as whey protein isolate, organic blackberry, organic raspberry, organic strawberry), Iron (as whey protein isolate, organic blackberry, organic raspberry), Phosphorus (as whey protein isolate, organic blackberry), Magnesium (as whey protein isolate, organic blackberry, organic strawberry), Sodium (as whey protein isolate, sodium chloride, organic strawberry), Potassium (as whey protein isolate, organic blackberry, organic strawberry. Whey Protein Isolate, Xylitol. Proprietary Berry Blend: Organic Raspberry, Organic Strawberry, Organic Blackberry, Organic Goji Berry, Organic Acai berry, Organic blueberry. Stevia Extract (Stevia rebaudiana)(leaf) (standardized at 90% steviosides equal to 54 mg). Other Ingredients: Organic evaporated cane juice syrup, natural raspberry flavor, natural french vanilla flavor, natural strawberry flavor, xanthan gum, citric acid. Contains milk and soy. Have a question about 100% Berries & Whey Use our secure online messaging system to ask our Aegis Shield Experts.